A few weeks ago I was describing how to perform Linux Vulnerability Assessment without a Vulnerability Scanner. I also wrote in “Vulnerability scanners: a view from the vendor and end user side” that vulnerability scanning is not rocket science and it is easy to make your own scanner for vulnerabilities for a particular OS. Especially it is a popular Linux Distribution. Vulners Team guys have actually created such free Linux Vulnerability Audit service! 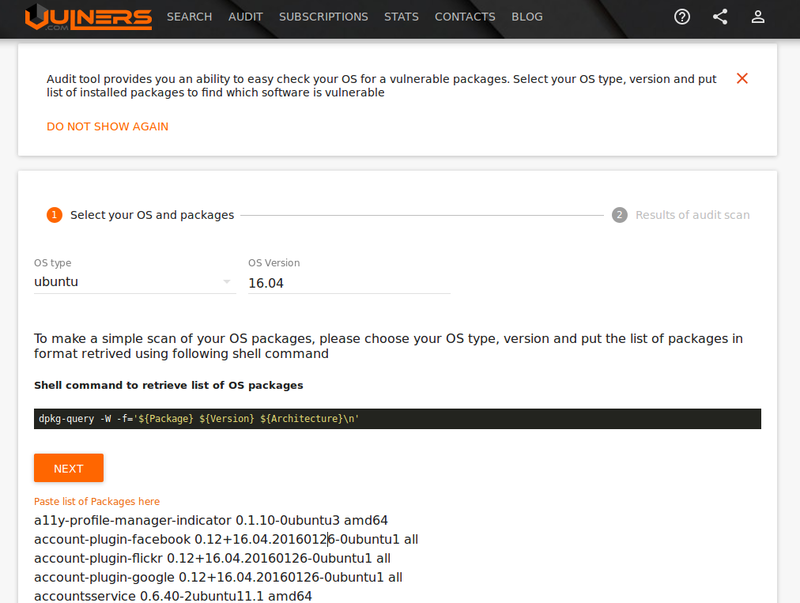 First of all, they made a GUI where you can specify OS version (usually it is in the /etc/os-release file), list of packages installed on the host and get the list of vulnerabilities. But GUI is good for demonstration. In real life, you can use Vulners Audit API. It will return list of vulnerabilities in JSON. They also presented a PoC of local agent for their further Vulnerability Management cloud solution. At the moment, it’s just a python-script, but in the future there would packages for different the operating systems. The agent is fully functional. It not only collects data from the system, and sends it to the Vulners server for analysis, but also receives vulnerability lists from the server and displays vulnerabilities in console. As you can see, it really works. However, there will always be some questions related to to cloud and agent based Vulnerability Management solutions. I would like to share my opinion on them. 1. Is it safe to send information about the hosts (and vulnerabilities) to a remote cloud service? This is a worldwide practice. TOP3 Vulnerability Management vendors have their own cloud solutions (Qualys Cloud Platform, Nessus Cloud, Rapid7 Nexpose Now). For Qualys cloud-based solution is the main product, and this vendor has the biggest VM market share according to Gartner. Using of VM cloud solutions is a matter of trust to a particular vendor. The same trio provide hosted solutions (Qualys private cloud appliance, Tenable Nessus and Security Center, Rapid7 Nexpose). If some companies will want to use local Vulners servers in their network, I think it’s quite possible that Vulners Team will release such solution. Mix real and non-existent software packages in input, and exclude vulnerabilities of non-existent packages from the results. Use a “proxy server”, and make all requests to Vulners from this host only, hiding real ip-addresses and host names. 2. Is it safe to use local agents for vulnerability detection? The use of agents for vulnerability detection is a recent global trend in VM. Agent-based solutions fast and reliable results. All you need is to install agents. You do not need to create scanning accounts, manage network access for the scanners and determine right time when the scan will not interfere with normal operations in the network and so on. Tenable and Qualys presented their agent-based solutions not so long ago. They are very different. Tenable Agents are the Nessus installations without GUI and limited to scan only localhost. Nessus has been historically available for many platforms. Therefore, it was easier to do. Qualys created very minimalistic agents. They weigh just a few megabytes. It seems that Qualys Agents was written from scratch (Read more at “Dealing with Qualys Cloud Agents“). In the case of Tenable Agents, vulnerability detections occurs on the host. 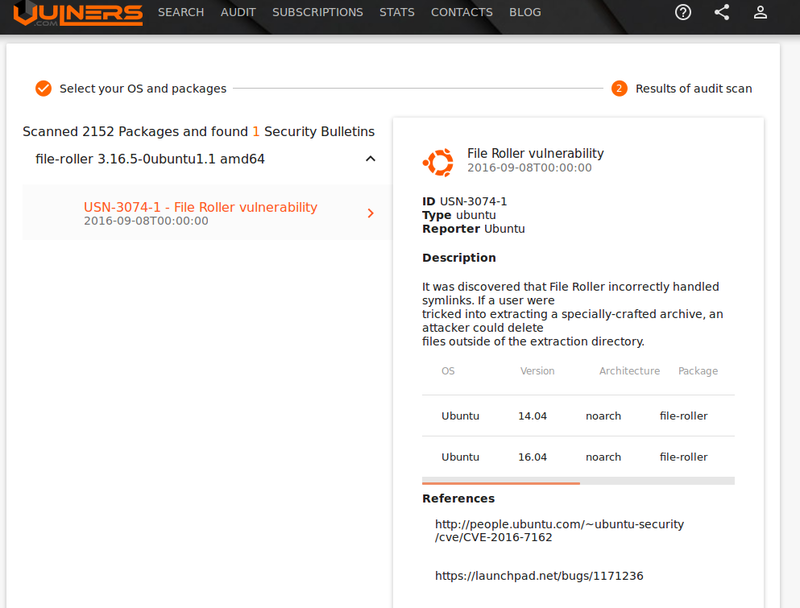 Tenable Agent sends vulnerability data to the Nessus Cloud (Manager). In the case of Qualys, Agent collects a minimum set of data from the host and then sends it to Cloud Platform/Private Cloud Platform/Private Cloud Appliance for the further analysis. Vulners Agents are similar to Qualys ones. And I think Vulners will evolve towards Qualys Asset View and Qualys ThreatPROTECT. Dashboards, vulnerability reporting, asset management will be in the cloud (private cloud), and Vulners agents will be only responsible for data collection. The main advantage of Vulners is openness of the agent. Vulners Agents use the same open Vulners Audit API. This openness may provide greater flexibility of VM solutions: user will be able to restrict or modify the data, which Agent sends to the server, for example, to mask host names and IP addresses or even import data from other sources, like IT monitoring systems. It may be an advantage both in terms of functionality and in terms of privacy. 3. Do we really need third-party tools for vulnerability analysis, if there are utilities like debsecan for Debian or yum list-security for RHEL? Indeed, there are a lot of vulnerability testing tools for different platforms. However, Vulnerability Management solution allow you to track of vulnerabilities for many platforms in a uniform manner and they don’t connect to the repository during the assessment. Solutions of this type provide detailed information about found vulnerabilities, how vulnerabilities may be exploited, patched etc. Working with separate linux utilities has its own quirks, e.g. ‘yum list-security’ works in RHEL, but does not work in CentOS. If small number of operating systems and devices are in use in organization, it is possible to live without Vulnerability Scanner/Management. It’s all about Linux yet. And it will be difficult to add similar functionality for Windows and Mac. And for for network devices only agentless scanning is available. Web interface for working with scan results is still in developing and vulnerabilities can be viewed only in the agent’s console. There are some fundamental limitations of Vulnerability Assessment using package versions. Some of them I mentioned in “Vulnerability Assessment without Vulnerability Scanner“. What if the software was installed from self-made packages (with some non-standard name and version) or was installed from the sources? This issues are out of scope for most VM solutions. 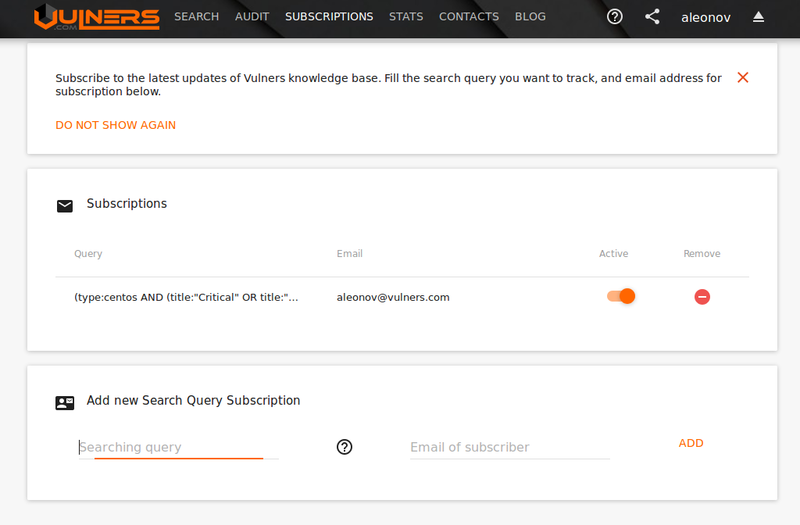 Another important free service, that was recently presented by Vulners Team, is email subscriptions. It makes possible to receive messages about new vulnerabilities as soon they appear in the Vulners database. 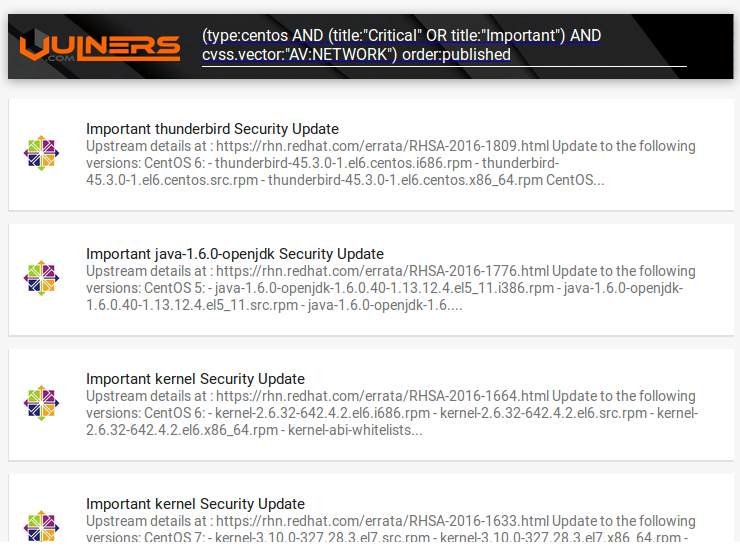 To subscribe, just specify search query (see how to use queries in “Vulners – Google for hacker. How the best vulnerability search engine works and how to use it“) you are interested in, and your email. The database is updated every 4 hours. You will receive an email when there will be something new in results of your search query. In the Enterprise version you can subscribe other people and you can track more than 5 requests. It will be great if you share your queries in the comments to this post. As you can see, Vulners is actively developing towards Vulnerability Management and Vulnerability Intelligence/Alerting. New functionality appears regularly. Almost all functionality is provided free of charge, even without advertising. And I hope that in the future this concept will stay the same: basic services will remain free for regular users and monetization will be made by adding new enterprise-level features. This entry was posted in Vulnerability Database, Vulnerability Management and tagged CentOS, Cloud Agents, Debian, email, Linux, Ubuntu, Vulners Audit, vulners.com on September 10, 2016 by Alexander Leonov.